The Heights at Eastwood project in Lansing Township will sport a new wine bar, a Mexican restaurant and a pastry shop, among other businesses, and they’re all slated to open before Black Friday. The $70 million public-private development north of the Eastwood Towne Center includes three hotels, an apartment complex and at least five new restaurants and cafes, nearly all of which will be open before the biggest shopping holiday of the year. Contract negotiations and poor weather had delayed most of the development past the original summer and spring opening projections, said Hayward, whose organization is overseeing the project. Steak and seafood restaurant Capital Prime will open a wine bar called Capital Vine next door in October. Chapelure, a pastry shop and café in East Lansing, will open a second location under the parking deck by November alongside Mimi’s Sweet Shoppe and a contemporary Mexican restaurant. Ahn said the diversity of offerings at the plaza is good for visitors to give them more options and keep them coming back. 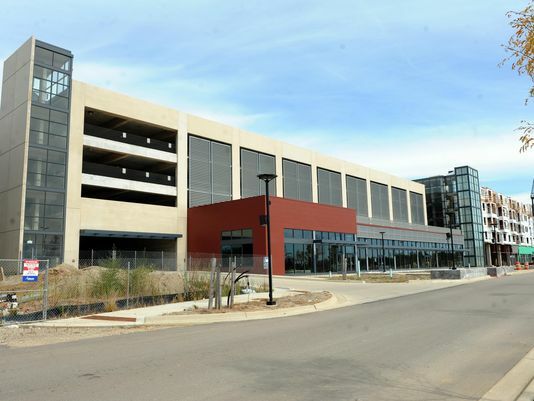 The parking deck that houses those businesses also offers 26,000 square feet for a potential ballroom or company headquarters site, Hayward said. DTN Management’s 124-unit Vista at the Heights will open by the end of September and will feature one-, two- and three-bedroom apartments. The Vista will offer 28,000 square feet of commercial space and an upscale breakfast café might be signing a lease this week to move in as well, Hayward said. The 128-room Hyatt Place Hotel opened in May and has already brought a surge of new customers to the surrounding businesses in the area, Hayward said. Tony Sacco’s Coal Oven Pizza, in the nearby standalone plaza, is expanding its patio to accommodate more customers. The $10 million, 121-room Fairfield Inn & Suites is scheduled to open in October along with a Boston’s Restaurant and Sports Bar. In addition, the Hilton Homewood Suites, an extended stay hotel, is submitting new plans this week for a seven-story, 139-room hotel, which is bigger than the original 109-room proposal. Construction is expected to start in the spring with a tentative opening date in 2017, Hayward said. The development is expected to generate $1.3 million annually for the township after a $1.7 million debt service is paid along with a $1 million annual payment to property owner Mike Eyde, who owns all 200 acres at Eastwood, Hayward said. The township has invested roughly $26 million into the project with $46 million in private funding. The plan is to eventually have the development privately owned. 2015 © Lansing Melbourne Group. All rights reserved. Call us at 754-701-8355. Melbourne Office: PO Box 510414, Melbourne Beach, FL 32951. Fort Lauderdale Field Office: 2420 E Sunrise Blvd, Ste #90, Fort Lauderdale, FL 33304.